Sunday, February 17th will be NBA All-Star game. 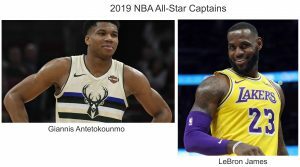 The two team captains are Giannis Antetokounmpo (Milwaukee Bucks) and LeBron James (Los Angeles Lakers). These guys were the vote getters among fan/media/players votes. On Thursday, Feb. 7 at the All Star Draft Show they chose their teams from the other all-stars that were voted into the game. Fans, the media, and the players vote for who should be on these teams but how are their total votes computed? Evenly? Weighted? What formula does the NBA use to determine who is an All-Star? Let's do the math!